Tour participants will enjoy a pleasant 110 miles drive around South Northamptonshire and North Buckinghamshire meandering through the back lanes and many delightful, yet little known, villages en-route through this rolling rural countryside. We will start our day with a complimentary bacon bap and cuppa taken at the iconic Jacks Hill Café, A5 Watling Street, Towcester. After a meandering drive into Buckinghamshire, including skirting Stowe House with its imposing Corinthian arched entrance, and crossing Buffler’s Holt ford, (full of water in the winter months but probably fairly dry in June), morning coffee will be taken at the Flight Deck café, Turweston Aerodrome. Here patrons enjoy an elevated view of the light aircraft action from the dining room and balcony in the tower. After coffee we will make our way into South Northants, then north-westerly to our next refreshment halt at Whilton Locks Garden Village. Our tourists will follow a delightful winding back road drive around South Northamptonshire passing the Churchless Steeple at Little Brington. Continuing on; we will wend our way over the border of Warwickshire before returning to Northants and driving Newnham Hill, near Daventry, scene of early twentieth century motorsport action when it was used as a speed hill climb venue. Nowadays Newnham Hill features as a ‘Queen of the Mountains’ stage on the annual Womens Tour of Britain cycle race, but in 1906 Cecil Edge fearlessly drove his works 60HP Napier to fastest time of the day over the 1136 yard Newnham Hill course. Our tour finish will take place at the Old Red Lion, Litchborough, where a dedicated parking area will be set aside to display the cars whilst tour participants enjoy a welcome buffet at the end of their day. The Tour is a non-competitive event for classic cars, and is part of the HRCR Scenic Tour series of events. Marlins are welcome to enter. Other vehicles may be accepted at the discretion of the organisers. Regulations, Entry form, and contact details are available on the Falcon Motor Club web site. 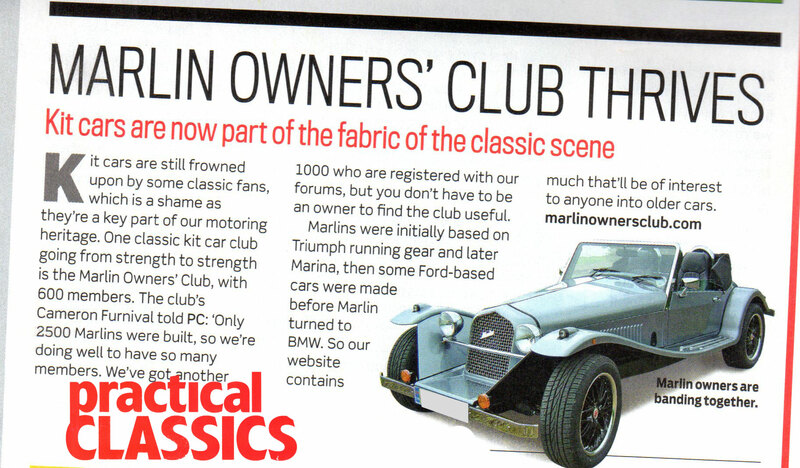 http://www.falconmotorclub.com/ where you can also enter online. Interesting, didn't the marlin club have multi day tours a few years ago? The year before I joined was,I think in Scotland. Last edited by HairyDave; 05-03-2019 at 09:35 PM.